KCHUNG Radio at “Made in LA 2014,” Hammer Museum, Los Angeles. ABSENT FRIENDS—WHERE ARE THEY? 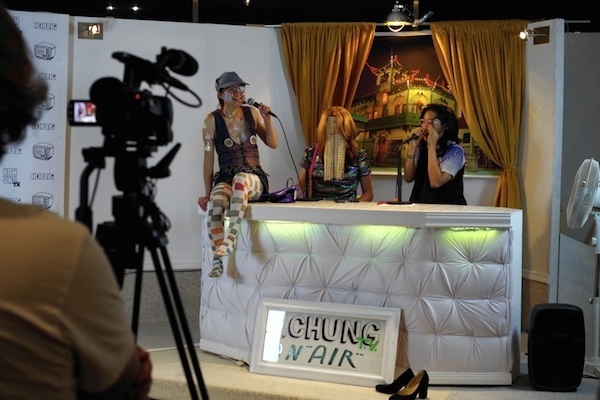 Why, pulling their weekly shift down at KCHUNG Radio, of course—or KNOW-WAVE or Clocktower—one of the mostly unlicensed, mostly Web-only, artist-run underground radio stations that have kept the on-air light lit in 2014. It’s a rare program that, given the nearly full-spectrum saturation of modern communication, nonetheless anchors a small and anonymous collaborative; collaboration being the buzzword, for example, of this year’s Made in LA biennial, which (to borrow Thomas Lawson’s phrase) set up “mildly anarchic” collective KCHUNG in the front lobby. In a fragmented aftermath, is it radio that brings people—and increasingly artists—together—à la Art Laboe? Radio’s one-way messages seem to have a ricochet. Pipe them into your dinner or your opening—make a request via Facebook or Twitter—I’ll see you in five to ten years, darlin’, an’ I’ll always love you. It’s no accident that, while these stations are glutted with free-form and party-ready programming, it’s their talk radio that has broadcast the most multivalent darts into the ether. Here DJs showcase not just arty music taste but interviews and roundtables or laser-targeted reportage, fanzine style. It helps, to overcome the turgid barriers of amateurism, to personally know the broadcasters, but ah, then, and sometimes anyway, it can be good, and often really good, to hear these folks talk. On LA’s KCHUNG, witness The Healing Light Comfort Zone, a thoroughly researched New Age hour hosted in turn by Ian James and Meredith Carter, or the ungroomed discursive efforts of Nooooooooooooooooooo, aka John Burtle and Guan Rong. But for a most erudite, buttoned-down, and meta take on the genre, see KCHUNG’s long-running The Talking Show, a moisture-sucking showcase of logorrheic art, including, in the past year, bootlegs of pieces by Kelly Mark and Karl Holmqvist. And then there was artist Ian Hoakin, whose story of inheriting the family painting business forms a rambling existential allegory of contemporary painting. With the exception of a handful of recent episodes, artist friends Steve Kado and Nicholas Miller, based in Toronto and Marfa, Texas, respectively, have falsified their on-air banter, closing kilometers and miles through the magic of file-sharing—a method that has the benefit of tempering the pretentious rambling that characterizes independent broadcasting. Meanwhile, emanating from the land of W- call signs was artist Anicka Yi’s Lonely Samurai podcast. In May she made three posts, all of which in their way cut deep into a different issue pertaining to contemporary art; for example, a conversation between actual perfumer Christophe Laudamiel and scent artist Sean Raspet; or, in the first, hard-hitting installment, a panel discussion about straight female networks—the lack thereof—featuring Stefania Bortolami, Cristina Delgado, Ruba Katrib, Andrew Russeth, and Amy Sillman. A piece like this plainly extends the concern for community pursued in Yi’s other projects, such as her 2013 “Politics of Friendship” exhibition at STUDIOLO, where Yi extended her planned solo show to include three friends; an accompanying pdf became a similar friend-boosting vector, including thoughts on friendship from another two dozen artists. Besides broaching an issue close to Yi’s own heart, her first podcasted convo had the added dimension of one guest, actually satisfied with her support group, expressing unqualified disagreement with the segment’s premise. Honest views were voiced, friends—a wailing solo amid so much soft-pedaled discourse; and the Lonely Samurai had pressed record. Travis Diehl is an artist and writer based in Los Angeles. He edits the artist-run journal of art Prism of Reality.